Steve Boster, M.D. was raised in San Angelo, Texas and practiced Emergency Medicine there for 33 years. 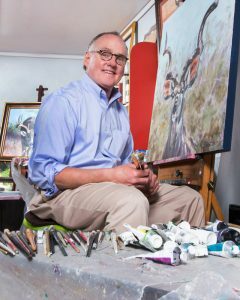 Dr. Boster started painting full-time in 2015 and his studio is located in the Chicken Farm Art Center in San Angelo Texas.. He enjoys painting animals including North American and African wildlife, as well as cattle, sheep, and horses. His style ranges from realism to early impressionism, often with vivid colors. He has been an outdoor and hunting enthusiast his whole life. 100% of the sale price of all paintings goes to Fisher House Foundation, a four-star charity that provides meals and housing for the families of hospitalized soldiers and veterans. He and his wife of 39 years, Mary, have three grown children: Eva, Hayden, and Julia.